This vest has been carefully planned, contrary to the reversible leather vest (see here) which was an impluse purchase. Ever since I saw Fool for Fabrics marvelous red vest–she loves Red–the pattern, trims, pockets, fabric, were always in my head. 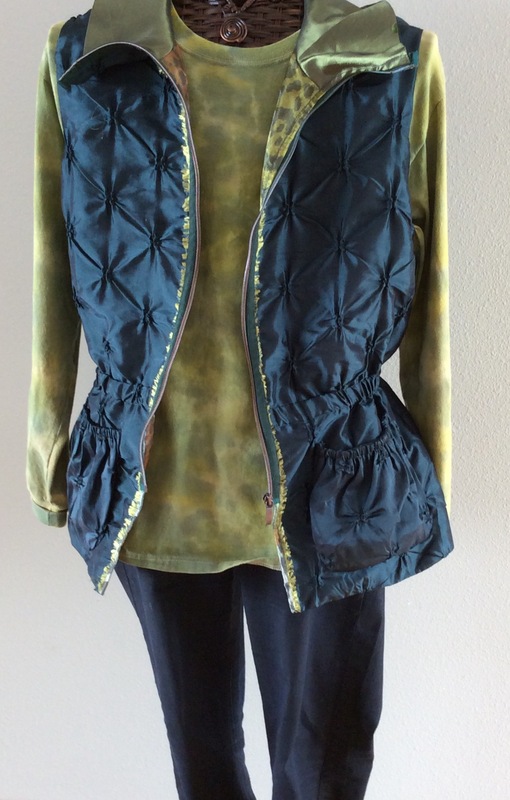 I’m not the only one inspired by Margy, Fool for Fabrics, Just saw Shams teal vest inspired by another of FFF vests. The fabrics I chose are all polyester, soft and the outer fabric is textured with stitching to created a star pattern. All of these contribute to an easy care, non-crush garment. Simplicity 2153 is OOP but available here on Etsy. Fabric from Jo-Ann Fabrics Red Tag (discounted) table. Multi-tasking on Snowbird condo kitchen table. 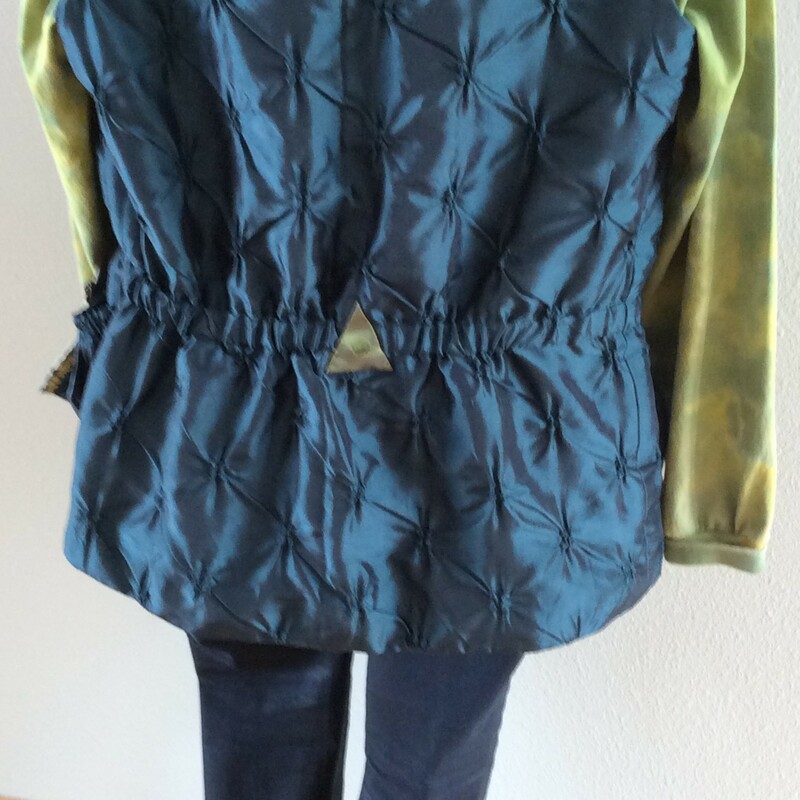 Alterations–none as wanted vest to fit over sweaters. Did a pattern dry-fit. 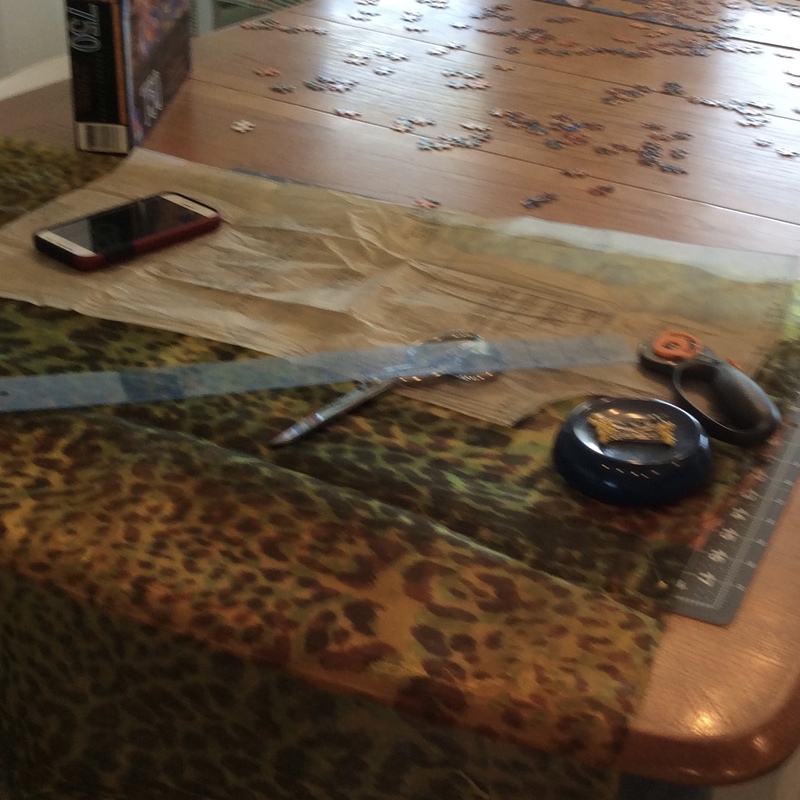 Cut three garments–one from each fabric. 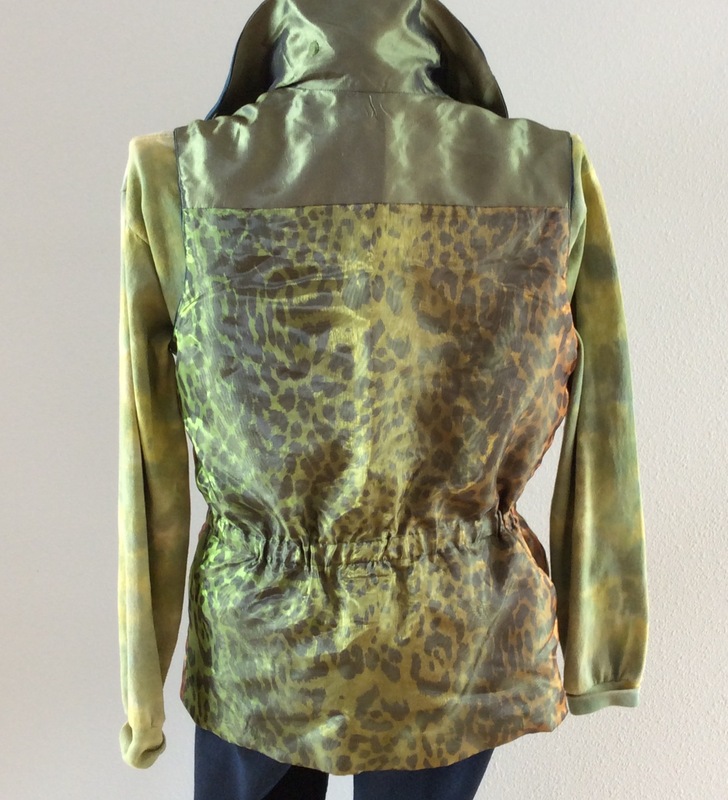 Layered chiffon over medium green jacquard; stitched layers together 1/4″ from cut edge. Cut out inside pockets from medium green jacquard. Used pocket piece from pattern for bottom pockets. Designed pattern for upper pockets to fit my cellphone; it’s fairly snug to prevent phone from slipping and sliding around, but loose enough to easily extract. 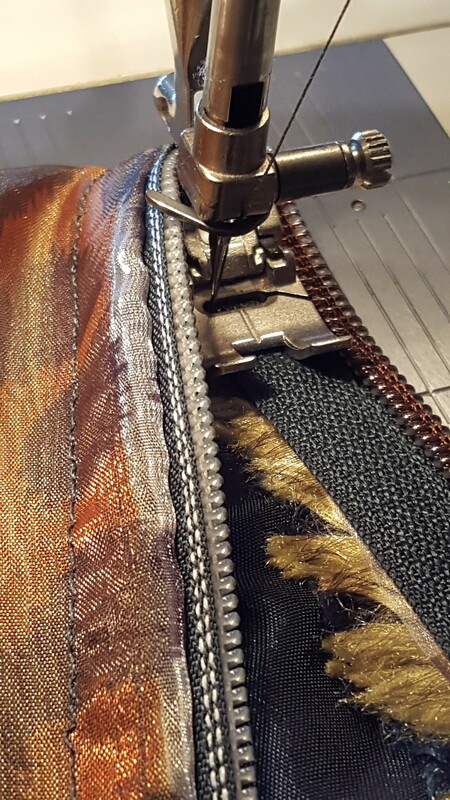 Edge-stitched pockets in place to lining. Pockets for right side are from pattern. Inserted narrow elastic in pocket top hem; adjusted elastic length so pocket is flat against vest front. Eliminated collar drawstring–always end up caught in zipper. 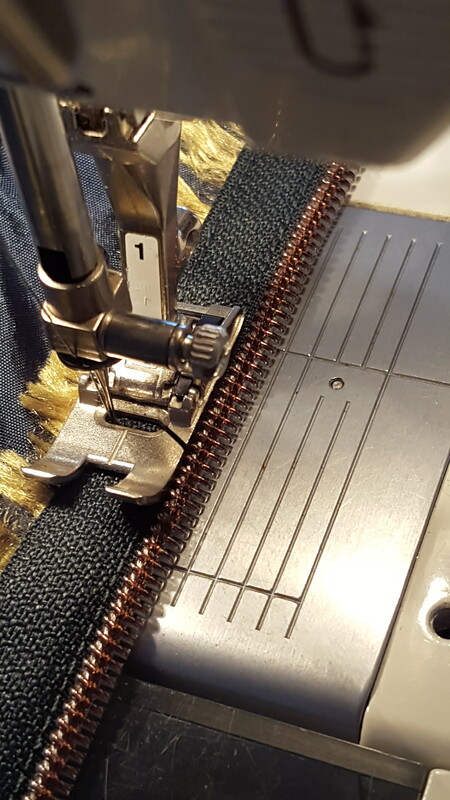 Replaced waist drawstring with elastic; elastic keeps fullness evenly distributed whereas a drawstring requires much fiddling each time vest is worn. Completed vest and lining as two separate garments leaving underarm seams open. Turned right side out, trimmed and pressed seams. Stitched vest and lining wrong sides together at underarm seam–one continuous seam. Trimmed and pressed, turned right side out. Turned hem edges so wrong sides matched; stitched, trimmed and pressed. Turned right side out through center front opening. Center front on both vest and lining are cut on selvedge. 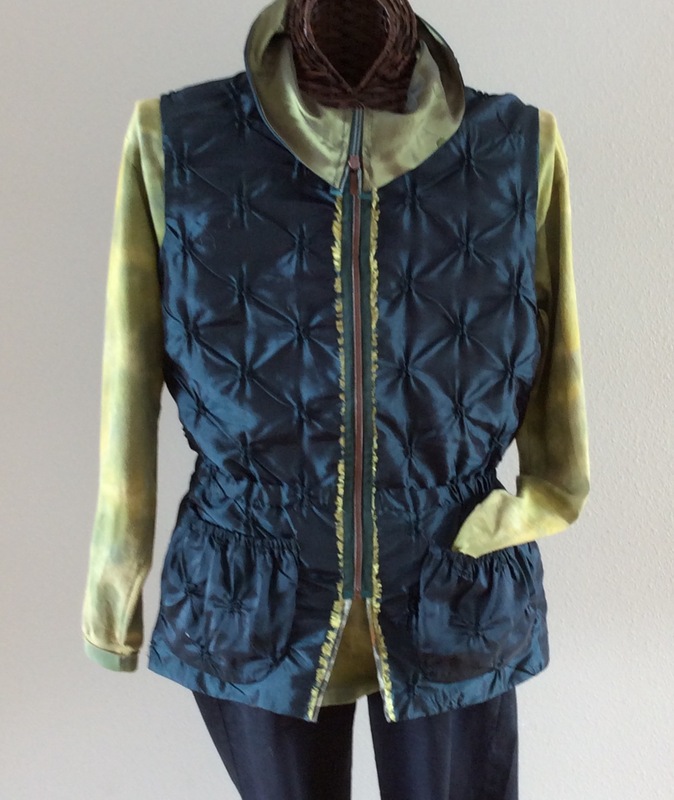 Hence the bright green selvedge fringe from the iridescent vest fabric. Separated the zipper and, on the lining side, placed the outside edge of zipper tape, right side up, next to the selvedge fringe. Stitched the tape to the lining as close to the zipper teeth as possible. Stitch as close as possible to zipper teeth. Zipper is right side up on lining side of vest. Fold tape to the right side; the zipper teeth are now exposed and the tape covers the seam allowance. 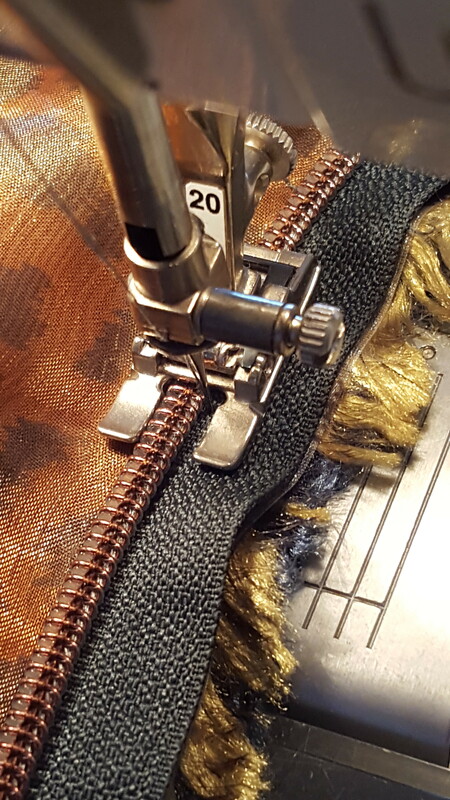 Topstitch zipper tape (edge next to selvedge fringe) through all layers of vest. This step closes up all openings to inside of vest. Edgestitch outer edge of zipper tape to right side of vest. Lining side of vest is clean finished as seam is under zipper tape. Added a triangle to the center back elastic; it’s decorative and, because it is stitched through elastic, it keeps the fullness in place. Can’t wait to wear this with the tie-dyed shirt found at a Flea Market. Perfect color combos, right? 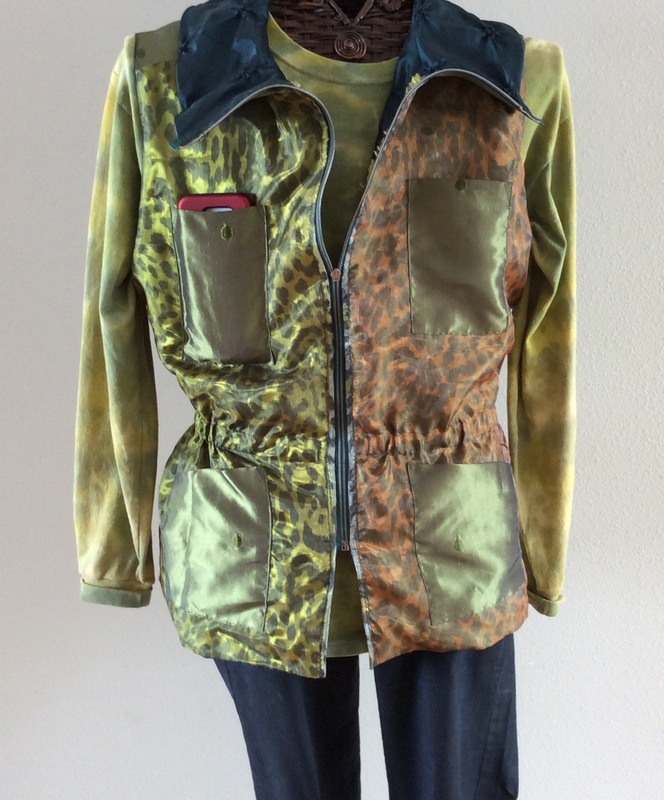 This entry was posted in FIBER FASHION FUN, Uncategorized and tagged ebates, iridescent, Jo-Ann VIP Discount, pockets, pyramid, Simplicity 2153. Bookmark the permalink.